To be truly prepared, you need to be ready for anything, including the possibility of a chemical warfare attack. RSDL, a medical countermeasure by Emergent BioSolutions. Use only if chemical warfare agent exposure is suspected. 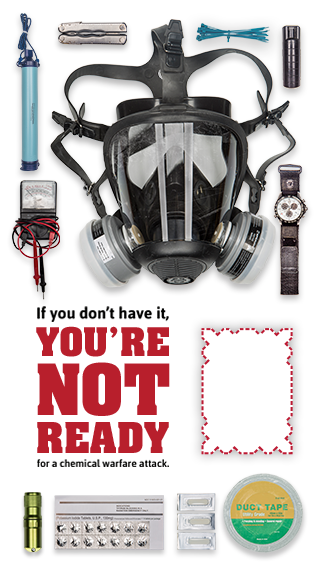 In the event of a chemical warfare attack, are you prepared? The Reactive Skin Decontamination Lotion (RSDL) Kit is intended to remove or neutralize chemical warfare agents and T-2 Toxin from the skin. It’s military grade, lightweight, Food and Drug Administration (FDA) cleared, and starts working in 2 minutes. * The threat of exposure to a chemical warfare agent (CWA) is real. Be prepared. *Based upon laboratory tests; clinical relevance unknown. The Reactive Skin Decontamination Lotion (RSDL) Kit is intended to remove or neutralize chemical warfare agents and T-2 Toxin from the skin. For external use only. Use only if chemical warfare agent exposure is suspected. CAUTION: Use only as directed. Not for use prior to exposure (i.e., prophylactic use) or whole-body decontamination. Allow RSDL to remain on the skin for at least two minutes. An RSDL ingredient is absorbed through the skin and may cause adverse effects. Avoid leaving on skin for long periods. Avoid contact with the eyes. Remove RSDL when conditions permit. WARNING: Fire Hazard. Combustion may occur upon contact with strong oxidizing chemicals (e.g. dry chlorine products like, HTH [calcium hypochlorite powder], super tropical bleach). Do not discard used RSDL components into strong oxidizing chemicals or their containers. Intended for US audience only.